POEM aims to create a museum in Eugene, Oregon for historical and contemporary Pacific Northwest art. 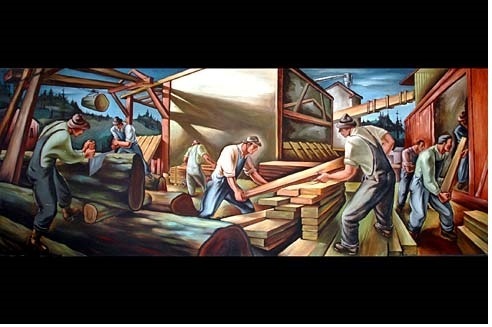 Inspired by the WPA-era Carl Morris murals in the Eugene Post Office, we hope to preserve that space by transforming it into a vibrant public center that will engage, educate, and visually inspire all who enter. We seek partners, supporters and participants among the artists, scholars, businesspeople and arts-loving citizens of Cascadia. Our mail address is POB 3437, Eugene Oregon 97403-9701, and our email address is poempnw@gmail.com. Get in touch with us to talk about how you can be involved in the project, or support our mission. This is a wonderful statement “about” the Post Office to Eugene Museum committee. I hope that city and county and state officials will recognize any investment as crucial to the economic and commercial future of Eugene. Without action, this will be remembered as a squandered opportunity. Our current strategy should be to get the buzz going at a high frequency regarding our mission and Museum-related goals for the post office. We also must get the leading families of industry, communications, and commerce, involved in our efforts. The vision must be for the entire block(s) of the post office area to accomodate the Lane Historical Society and our visual arts museum and arts school complex. I’d like to be involved with the future transformation and support NW artists. Please keep me informed. I’m adding you to the POEM mailing list. You can find us at poempnw@gmail.com if you’d like to be more involved.